Sara Hegna (left) and Blair Boyle. (Photo courtesy of Blair Boyle ). 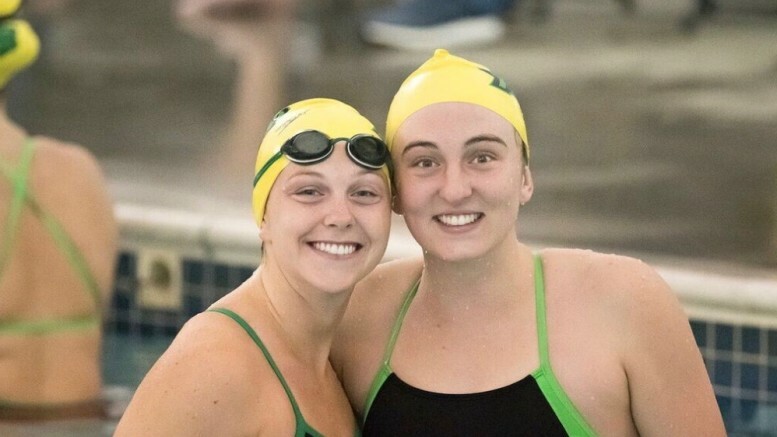 With winter sports on the Hill well underway, swimmers Blair Boyle and Sara Hegna have risen as prominent figures within the McDaniel athletics community. Both Hegna and Boyle have already cemented themselves into McDaniel College history, holding several records, with the drive to break even more. “Once you break a record once you are like, ‘Oh yeah, I want to do that again and again,’” Boyle said. Boyle, a sophomore from Springfield, N.J., currently holds the school record in the women’s 100-meter freestyle race with a time of 52.64 seconds. Hegna, a junior from Brielle, N.J., holds the pool record for both the 100-meter and 200-meter backstroke races. In addition, Hegna was a part of the school record-setting 200-meter and 400-meter medley relay races in 2017. Finally, the two New Jersey natives come together to find success in relay competition, having set the school record for the 800-meter freestyle relay race and the pool record for the 400-meter medley relay race in 2018. Despite already having several name places on the board, both Boyle and Hegna want to hold as many records as possible. “My biggest goal at the end of college is to have my name up on that board and leave my mark,” Hegna said. Both swimmers started participating in the sport at a young age. Hegna comes from a swimming family and, along with the sport, had a pre-developed connection to McDaniel, as her father swam competitively at Western Maryland College. “That was a huge inspiration for me to come here and swim,” Hegna said. Similar to Hegna, Boyle’s interest in swimming emerged from family members who swam. Growing up, both Boyle and her brothers swam competitively year-round. Establishing an early foundation into swim and emerging as two of women’s swim top competitors has paved the way for relationships with teammates growing into friendships that support one another, both on the pool deck and off. Having established that connection with teammates, both Boyle and Hegna have emerged as leaders on the team and look to become official captains in the coming seasons. The rise to leadership and success in competition is rooted in mentality. With a champion’s mindset, the focus that Hegna and Boyle bring spreads among their teammates. Ultimately, Jan term creates one of the final opportunities for training before the final leg of the winter sports season, and both Boyle and Hegna recognize that.